The guys over at Broken Review are back, and this time they are testing the durability of the iPod Touch. And like their previews reviews of the Nintendo DS Lite, and the Sony PSP, they put the IPod through all of the usual tests… like dropping it into a bath tub full of water, and dropping it out of windows at 25mph. 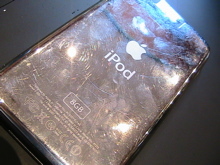 To find out how the iPod touch faired, check out Broken Review.